Currents and climate – still not settled | Watts Up With That? (new current not shown) Topographic map of the Nordic Seas and subpolar basins with schematic circulation of surface currents (solid curves) and deep currents (dashed curves) that form a portion of the Atlantic meridional overturning circulation. Colors of curves indicate approximate temperatures. Source: R. Curry, Woods Hole Oceanographic Institution/Science/USGCRP. An international team of researchers, including physical oceanographers from the Woods Hole Oceanographic Institution (WHOI), has confirmed the presence of a deep-reaching ocean circulation system off Iceland that could significantly influence the ocean’s response to climate change in previously unforeseen ways. 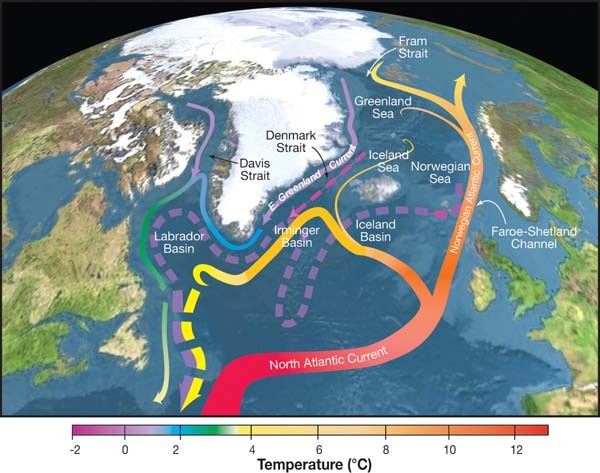 The current, called the North Icelandic Jet (NIJ), contributes to a key component of the Atlantic Meridional Overturning Circulation (AMOC), also known as the “great ocean conveyor belt,” which is critically important for regulating Earth’s climate. As part of the planet’s reciprocal relationship between ocean circulation and climate, this conveyor belt transports warm surface water to high latitudes where the water warms the air, then cools, sinks, and returns towards the equator as a deep flow. Crucial to this warm-to-cold oceanographic choreography is the Denmark Strait Overflow Water (DSOW), the largest of the deep, overflow plumes that feed the lower limb of the conveyor belt and return the dense water south through gaps in the Greenland-Scotland Ridge. For years it has been thought that the primary source of the Denmark Overflow is a current adjacent to Greenland known as the East Greenland Current. However, this view was recently called into question by two oceanographers from Iceland who discovered a deep current flowing southward along the continental slope of Iceland. They named the current the North Icelandic Jet and hypothesized that it formed a significant part of the overflow water. “In our paper we present the first comprehensive measurements of the NIJ,” said Robert S. Pickart of WHOI, one of the authors of the study. “Our data demonstrate that the NIJ indeed carries overflow water into Denmark Strait and is distinct from the East Greenland Current. We show that the NIJ constitutes approximately half of the total overflow transport and nearly all of the densest component. The researchers used a numerical model to hypothesize where and how the NIJ is formed. “We’ve identified a new paradigm,” he said. “We’re hypothesizing a new, overturning loop” of warm water to cold. The results, Pickart says, have “important ramifications” for ocean circulation’s impact on climate. Climate specialists have been concerned that the conveyor belt is slowing down due to a rise in global temperatures. They suggest that increasing amounts of fresh water from melting ice and other warming-related phenomena are making their way into the northern North Atlantic, where it could freeze, which would prevent the water from sinking and decrease the need for the loop to deliver as much warm water as it does now. Eventually, this could lead to a colder climate in the northern hemisphere. While this scenario is far from certain, it is critical that researchers understand the overturning process, he said, to be able to make accurate predictions about the future of climate and circulation interaction. “If a large fraction of the overflow water comes from the NIJ, then we need to re-think how quickly the warm-to-cold conversion of the AMOC occurs, as well as how this process might be altered under a warming climate,” Pickart said. “These results implicate local water mass transformation and exchange near Iceland as central contributors to the deep limb of the Atlantic Meridional Overturning Circulation, and raise new questions about how global ocean circulation will respond to future climate change,” said Eric Itsweire, program director in the U.S. National Science Foundation (NSF)’s Division of Ocean Sciences, which funded the research. The Research Council of Norway also funded the analysis of the data. Pickart and a team of scientists from the U.S., Iceland, Norway, and the Netherlands are scheduled to embark on Aug. 22 on a cruise aboard the WHOI-operated R/V Knorr to collect new information on the overturning in the Iceland Sea. In addition to Pickart, authors of the Nature Geoscience study include Michael A. Spall, and Daniel J. Torres of WHOI, lead author Kjetil Våge, a graduate of the MIT-WHOI joint program now with University of Bergen, Norway, Svein Østerhus and Tor Eldevik, also of the University of Bergen, Norway, and Héðinn Valdimarsson and Steingrímur Jónsson—the two discoverers of the NIJ—of the Marine Research Institute in Reykjavik, Iceland. The Woods Hole Oceanographic Institution is a private, independent organization in Falmouth, Mass., dedicated to marine research, engineering, and higher education. Established in 1930 on a recommendation from the National Academy of Sciences, its primary mission is to understand the ocean and its interaction with the Earth as a whole, and to communicate a basic understanding of the ocean’s role in the changing global environment. Thank God for scientists who do empirical research. They can turn up such a huge flow of cold water that the existing account of the AMOC has to be revised. I wonder what other climate scientists could discover if they actually ventured away from their computers and looked for stuff? The science is not settled. Heck, the building blocks of Earth’s climate haven’t even been mapped. I agree with Fred and would add “The more we know, the more we don’t know what we don’t know”. The models seem to be worse than we thought. The level of desperate floundering grows by leaps and bounds. When they find out they know less than they thought, they wonder how this will be affected by global warming. Ignorance must mean “the science is settled” on the planet they come from. I think this is an important paper because it forces people to look more carefully at the “Ocean conveyor belt”. Wunsch has maintained and done the math, the conveyor belt as commonly depicted is “pure science fiction”. He has convincingly demonstrated that only winds and tides provide the necessary energy to affect the overturning circulation. The winds will continue to deliver the warm waters poleward. The warmist however suggest that the conveyor belt will stop because the warm saline waters delivered by branches of the Gulf Stream will not cool sufficiently to sink and “complete the loop” of the conveyor belt. But it is as unfounded an assumption as the science fiction portrayed in the movie” The Day After Tomorrow” The logical extension from Wunsch’s analyses is that the temperature gradient from the pole to the equator will always generate the winds that drive the surface currents like the gulf Stream, but the return flow can have many less obvious return routes at different depths. The depth that the returning Gulf Stream waters sink, is determined as much if not more so by salinity caused density due to evaporation as it is by cooling temperature. The waters can return at different depths and still “complete the loop”. If they don’t cool and sink to hypothezied depths of the conveyor belt they will return at other depths, mass balance dictates this. I suggest this paper is the beginning of deconstructing the simplistic notion of the conveyor belt that Wunsch and others call pure fiction. But the science is settled. Sarc off.Interesting how little is really understood by the team.I agree with Fred, nice to see someone is still doing earth observation/science. Until further notice it is changes in the oceans [e.g. the PDO for medium term or the ENSO cycles for short term] that affect weather and by extension regional climates [see PDO]. Any evidence that “climate change” aka “global warming” is changing the behaviour of the oceans? This paper wants to imply that AGW might change that. Only implies. No evidence. Meanwhile the temperature fluctuations between a normal El Nino and and a normal La Nina exceed the 0.7 overall increase since 1850. They don’t know how ocean currents work after all? That means we’re doomed. This line has always bothered me…. Climate specialists have been concerned that the conveyor belt is slowing down due to a rise in global temperatures. If the conveyer belt were to be modeled as a heat engine. Equatorial temperature would be (TH) and Polar temperature would be (TC). The conveyor belt, being mass in motion, would be (W). 1) Global warming will cause a reduction in the difference between (TH) and (TC). This will in turn cause a reduction in (W), hence positive feedback and more evil global warming. I don’t believe this. 2) Global warming will cause an increase in the difference between (TH) and (TC). This will in turn cause an increase in (W), hence negative feedback and we can all get over this global warming thing. An increase in (W) means the conveyor won’t slow down. Anyone else ever ponder this? Comments? So, if the world heats up then the conveyor belt slows down leading to cooler arctic temperatures…which seems to define yet another negative feedback to me. Stating “…and how this will be affected by climate change.” at the end of paper has become akin to “Burma Shave” at the end of witty highway signs. It will be interesting to see if data from actual observations supports or refutes the computer model. I wonder if we will hear anything more of this should the hypothesis turn out to be false? So those predicting the disappearance of Arctic summer ice will be so disappointed. There are annul solar declinational tides and 27.32 day lunar declinational tides that help to drive the meridional circulation in the deep ocean as well as lunar declinational tides in the atmosphere that generate the winds mentioned in this paper, that reflects what I said here. And what kind of data will they gain given they will be studying the process under a cooling climate? I think this is an important paper because it forces people to look more carefully at the “Ocean conveyor belt”. Wunsch has maintained and done the math, the conveyor belt as commonly depicted is “pure science fiction”. He has convincingly demonstrated that only winds and tides provide the necessary energy to affect the overturning circulation. The winds will continue to deliver the warm waters poleward. The warmist however suggest that the conveyor belt will stop because the warm saline waters delivered by branches of the Gulf Stream will not cool sufficiently to sink and “complete the loop” of the conveyor belt. Thanks! How many times have we heard that global warming could stop the Gulf stream and make us (Scotland) as cold as the West Coast of the Atlantic which is several degrees colder. Even a cursory look at currents in the Pacfic and comparisons of W-E temperatures shows that the pacific where there is no significant gap into the Arctic shows the same W-E temperature differential, which clearly has everything to do with trade wind driven currents and nothing to do with barmy global warming nonsense. That is the most welcome news. I’ve been rumbling for some time about the importance of ocean currents in the area, but felt that the picture was not complete. Dr. Leif Svalgaard may remember as he called it ‘your favourite area’ and the ‘reversed correlation’ as posted on the WUWT a year or two ago..
but there has been more progress since then. There is far more to the N. Atlantic then the credit is given to. These researchers are to be congratulated on discovering more details of the mechanism by which the world goes on being ordinary – ice ages apart, that is (and even they are part of a long-term same-old same-old.rhythm). and lots more…Time flies, doesn’t it? And I written only about dozen pages of my article on the natural causes of climate change. If it was not for the ‘addictive’ attraction of the WUWT , I would have not done even that, or more likely none of it. Thanks to Anthony for the hospitality and Dr. Svalgaard for the ‘encouragement’ . Sounds like a fairly simple negative feedback loop. Only if it was that simply….. If people give you a hard time about reversing temporal correlations, just remind them of the spatial dimensions. For example, a jet moves from one side of a point to the other, reversing the direction of the back-eddy loop. (Note: There are other spatial pattern changes that can reverse temporal correlation.) LINEAR correlation is categorically NOT the right measure of coherence in such contexts; rather COMPLEX correlation should be used. The reality to which everyone has to wake up is that temporal correlations can & do reverse sign due to spatial change. And yes, this reality applies to geomagnetic indices. In what context might one expect simple linear correlations? Perhaps laminar flow in a narrow tube – (not exactly a good Earth model). “There are annul solar declinational tides and 27.32 day lunar declinational tides that help to drive the meridional circulation in the deep ocean as well as lunar declinational tides in the atmosphere that generate the winds mentioned in this paper, that reflects what I said here. Gravitational tides …& thermal tides. Don’t forget about semi-annual insolation tides in the atmosphere. This stands out to me as a key piece of the picture that you never emphasize …even if you are aware. Thank God for scientists who do empirical research. They can turn up such a huge flow of cold water that the existing account of the AMOC has to be revised. 3. EXPERTS AGAIN, HARD AT WORK. Tomorrow (next year), scientists all return to the academic puffed-up-edness, and go back to 1. above and start over again. I get so aggravated at this never-ending cycle of “We know everything > we are humble servants of honest inquiry > NOW we know everything… We know everything > …” And each time around, their chests puff out even more. Basically, we pay them to puff their chests out. Today is tomorrow’s yesterday, so, how can we accept today’s truth as they tell it, knowing it will be tomorrow’s man behind the curtain? Best we think for ourselves, taking their side into account, but deciding for ourselves. After all, hasn’t almost every scientific interpretation in history eventually been supplanted by a new one? The truth of the matter is that right now science is somewhere along the continuum between utter ignorance and all-knowing, with most of the knowing out ahead of us. But this one came out of Woods Hole, the institute that (with East Anglia) in the 1970s brought us The Oncoming Ice Age. (See the article above, “Climate predictions in 1974 – Famous glaciologists predicted the world going colder from 1974 until 2010.”) So, count on it being wrong sooner, rather than later. The level of desperate floundering grows by leaps and bounds. Now it WOULD have been real science, if only they had PREDICTED the existence of this current. I have yet to see any strong evidence of the North Atlantic having substantially increased fresh water influx. If anything, there is an ever decreasing influx as the long trailing edge of the great melt withers away. Probably one of top places I’d be looking for freshening would be the Gulf of Mexico, witness what has happened over the past year vis a vis the greater Mississippi system. they should be funding a huge oceanographic fleet to do actual measurement (i.e., science). and hiring thousands of nautical roustabouts capable of running said fleet. Guess which of these competing castes has the greater lobbying power? Not an insignificant number of elements on the periodic table were predicted to be there (in fact the scientist was sure about it) but little was known about what they might look like in detail. That there was an inkling about what to look for and where to look was based on a model. Just food for thought. Let’s not throw the baby out with the bath water. In the 60s and 70s oceanographers were grumbling that more was known about the surface of the moon than the ocean deeps. Radioactive fallout from nuclear testing 50 years ago provided a way of tracking currents, which the US military seized on for obvious reasons, and the Navy and others have continued to map lateral and vertical mixing by injecting dyes into the ocean, and the dispersion of the plumes can be tracked by satellites. It’s a fascinating area of research, and the bits I’ve focussed on here are just a small part of it. I think this is an important paper because it forces people to look more carefully at the “Ocean conveyor belt”. Wunsch has maintained and done the math, the conveyor belt as commonly depicted is “pure science fiction”. Not at all, he has suggested that winds and tides can account for nearly all the energy needed for overturning, but whether these mechanisms are the sole, primary or secondary cause of the putative thermohaline ‘conveyer belt’, it doesn’t matter a great deal for AOGCM outputs. What is more troublesome is vertical mixing rates, and this has particular application to equilibrium climate sensitivity and climate model output. Wunsch’s inquiries primarily call into question the timing of oceanic thermal response to temperature changes in the atmosphere. He himself has no doubt that anthropogenic warming is an important issue that needs to be addressed – cf his letter of complaint to Martin Durkin, producer of The Great global Warming Swindle, who Wunsch says selectively edited his segment to misrepresent his analysis. No scientific theory is ever finally settled. The heating of the atmosphere on a global scale due to anthropogenic emmissions of greenhouse gases is so well established by empircal evidence and theory that it is now mainstream science. The details of where, when and how much are much less understood known and this is the subject of continuing research. Actually the properties of the elements were predicted because of where the gaps in the periodic table were. Also, Newton’s model of the universe led to the prediction of previously unknown planets. Newton was regarded as the absolute pinnacle of science for a couple of centuries, as close to “settled” as it was possible to be. But there were problems. The orbit of Mercury seemed to require another planet, Vulcan, which was not there. Then came relativity and quantum theory which provide our best understanding of the universe – for now. That is how scince works. There are models, there is consensus, but they are never permanent and always subject to challenge, revision and possibly overturning. But until the better explanation comes along, you use that consensus or model as the basis for understanding and further work and progress. it would be surprising that presence of a major current was not detected previously. Steve Garcia, your characterisation of how science is conducted is utterly fatuous. Scientists are not very interested in what they know, except as a means of extending our knowledge. Scientists like me spend our time confronting our ignorance, trying to understand and explain what we do not know, using what we do know to make new discoveries. Not all discoveries involve confirming predictions. Watson and Crick did not discover the double helical structure of DNA because someone predicted it. They used what was known about chemical bonding and the interpretation of X-ray crystallographic data to determine that the structure was a helix with a sugar phosphate backbone and base pairs. I will ask you again – what is the empirical evidence ?? No links. No appeals to authority. No telling us all what a great scientist you are. Just state in however many words you want, what the empirical evidence is that anthropogenic greenhouse gases cause a heating of the atmosphere on a global scale.. But there’s so much. What do you think is missing? That’s your empirical evidence. It’s not ‘proof’, but it’s the evidence you’re asking for. The details, especially on smaller time scales, require more explanation. Anyone positing that more CO2 won’t change the energy balance of the atmosphere, or that the rise of CO2 over the last 150 years is NOT mostly from human activity, or that there is no evidence, empirical or otherwise, that human activity is raising the temperature of the planet – is no longer participating in reality-based discussion. It may surprise you, barry, but I agree with all those points. However, there is no empirical evidence showing that CO2 causes rising temperatures. None. It may well be a cause of rising temperature. But the evidence is missing. It could just as well be temperatures naturally rising on the trend line from the LIA – coincidentally along with rising CO2. You have provided zero evidence that CO2 is the cause, and your added points are just as specious. It may be that CO2 causes warming. But without testable evidence confirming that conjecture, the null hypothesis remains unfalsified. Stick to the scientific method, and you won’t go wrong. Wunsch is not the only oceanogapher who sees through the myth of “the great conveyor belt.” The great wind-driven ocean currents that do affect climate are not materially dependent upon snail’s-pace thermohaline processes. But that fiction is necessary to maintain the link to climate-research FUNDING. My previous comment was meant to second yours. It may surprise you, barry, but I agree with all those points. However, there is no empirical evidence showing that CO2 causes rising temperatures. You’ll have to elaborate, because if you agree with those points, then I don’t see how you can depart from the conclusion. Googling up the Tyndall paper, I came across this marvelous little monograph, which says that one Eunice Foote made a presentation three years earlier than Tyndall, demonstrating the effect of increased heat from rising CO2.